DreamScene is a program originally released as part of the Vista Ultimate Extras Pack that animates your desktop background. It was never released for Windows 7. Microsoft seems to have replaced the Dreamscene feature from Vista with automatic changing wallpapers in Windows 7. 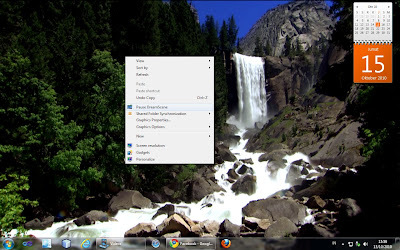 Now, we will enable Dreamscene in Windows 7. After enabling Aero, download the Windows 7 x86 (32 bit) Dreamscene patch here or read this article. After installing this patch successfully, right click the video then click Set as Desktop Background. See picture below, it's my Dreamscene with Waterfall video.